Group Executive of Aurizon’s Coal business, Ed McKeiver said the coal delivery was a key milestone for Aurizon and its newest Hunter Valley customer. “We have been working collaboratively over the past couple of months to test the loading of trains at the Mount Pleasant mine, near Muswellbrook, to ensure this delivery was successful,” said Mr McKeiver. 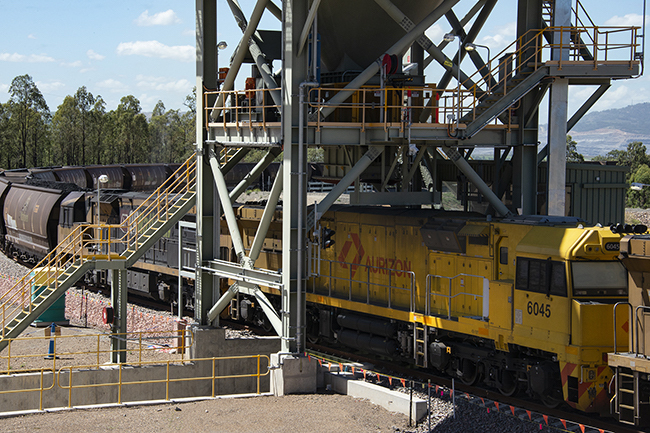 “This week’s first service is the start of a new long-term contract that will see Aurizon transport up to eight million tonnes of coal per annum for MACH Energy. “Initially we will be railing the coal for domestic electricity use before transitioning to railing to the Port of Newcastle for export markets. General Manager of MACH Energy’s Mount Pleasant Operations, Richard Bailey said they were thrilled to be partnering with Aurizon. “This marks a significant milestone for our business, months of planning and trials with the valuable assistance of the Aurizon team will see Mount Pleasant coal depart site for the first time,” Mr Bailey said. Ed McKeiver acknowledged the milestone was also significant for the coal industry by supporting local jobs and contributing to the local and national economies. “Having new mines like MACH Energy starting production is great for regional employment and for generating income in, and for, the local community,” Mr McKeiver said. “At Aurizon, we have employed new train drivers and commissioned new rollingstock to support our newest customer. “By providing reliable and safe rail services to our Hunter Valley coal customers over the years, we have been able to grow our business significantly. “When we started operating here in 2005, we had less than 10 employees and we now proudly employ more than 450 people across our Hunter Valley operations. “Our coal tonnages have grown from 180,000 tonnes per year to railing more than 52 million tonnes in the 2018 financial year. “We are proud of our role in the coal supply chain and the opportunity to partner with the Hunter Valley’s newest miner,” he said. Image caption: MACH Energy’s first trainload of coal being loaded.